Gabrielle Dolan, business story telling expert, shares a practical framework with us for how to use storytelling to build more KPI buy-in. Gabrielle Dolan, a world-leading expert on business storytelling, has spent the last 10 years or so teaching thousands of people all over the planet how to use storytelling in business to boost their ability to communicate and to lead. Her clients are based in Melbourne, London, Sydney, Malaysia, and lots of other places as well. For those of us passionate about performance measurement, we want our colleagues to care about it too. But as subject matter experts, we can struggle to really help other people get our great ideas. And of course a PowerPoint full of bullet points just doesn’t do that. 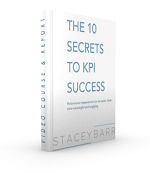 Is the curse of knowledge in your way of building KPI buy-in? We want out colleagues to understand how to write strategic goals so that they’re understandable and measurable. We want them to see why so many of the KPIs and measures in organisations really aren’t that good. We want them to get that measuring what matters can be easier, it can be faster, more meaningful, more engaging, that we need to adapt to deliver our process to make all that happen. If logic doesn’t build KPI buy-in, then what does? Speaking to the right brain, to the heart, is what works. Humans are hardwired for stories, so they are powerful ways to get our message across. We want to let go of the logical arguments. We want to let go of the typical management speak and that kind of language, and get to something more real. How exactly do we make performance measurement more relevant and meaningful for people? The answer is to use Gabrielle’s technique for structuring and telling a story that gets our message across. Don’t try to build KPI buy-in with logical bullet points. Build KPI buy-in with deliberate storytelling. 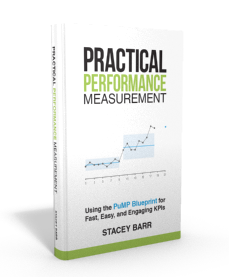 Reflect on how you’ve tried to engage colleagues in performance measurement in the past. Have you used logic, or story? What might you create a story about, to communicate the most important message about measurement your colleagues need to hear now? This information was great! It provides one more tool we can use to engage folks in the discussion about PMs. The tips about finding stories and crafting the delivery of our messages are particularly helpful. I’m excited to try them out. Thanks, Stacey! Great to hear, Janet! I’d love to hear of a story you end up crafting and using in your work. Please do let me know! Clever insight, Martin! Seems we might end up with a battle of the storytellers: pro-measurement and anti-measurement.